I have emailed Rachel several times with links to the bunnies that our readers have found. We also found one ourselves that is in our Catalog, and I wrote her about that, but she did not buy it. So, I think it is time to mark this one as FOUND, so all you kind folks who are searching to help people can use your time more wisely. Hi my name is Rachel. I’m looking for a replacement for my daughter’s favorite bunny. It is a musical pull toy. 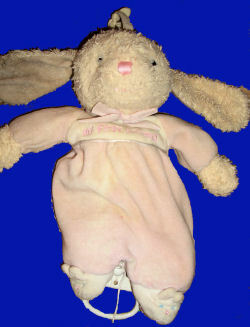 It is a cream colored bunny with a light pink outfit (body). On the chest it says “My First Friend.” It also has bunny slippers on its feet. It has a pink and white plaid ribbon around it’s neck. It was purchased in 2005. The tag on its leg says Bright Future made by Prestige Toy Corp. Looking forward to finding it! If you can help Rachel find this Carter’s Bright Future Musical Bunny Rabbit, THIS SITE IS NO LONGER ACTIVELY MANAGED. Please use Our FREE FACEBOOK GROUP, including #020708-2 in the subject, . I see that a Rachel bought this already… I hopoe it was “our” Rachel. I hope so, too, Tami! I haven’t heard back from her yet, though. 170193568756 here is another one if she didn’t get that one!